Funny how life sometimes gives us second chances. I was asked by the Highland Folk Museum to make them a mudag a few years ago. I thought it unlikely I would make another but then about a month ago Sheila Henderson, who has been coming on my basketmaking workshops, emailed me to say that Uig historical society, Lewis, who have a small museum in Uig community centre, were doing a spinning and weaving exhibition. I asked her if she knew about these strange shaped baskets, with a variety of names…that I know as mudags. She was able to look at the one on this site. So the society commissioned me to make one for them. We don’t know for sure that they were used here…hopefully it may be through the exhibition that someone will remember them, although possibly they may have died out in use outside of living memory. Dr Evelyn Baxter collected one on Skye where it was known as a ‘crealagh’. There is a good photograph of it in Dorothy Wright’s book ‘The complete guide to Baskets and basketry’ and she gives the dimensions. 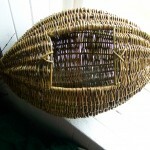 Length 19 ½”, diameter 12” and opening 6 ½” x 5 ½”. On my first attempt I remember making the two oval hoops to approximately 19”. 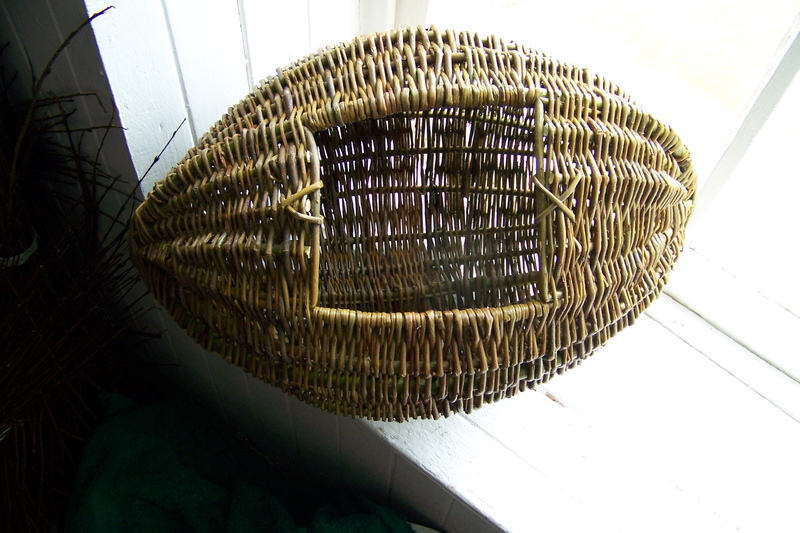 However as the basket progresses with the ribs added and gradually woven from each end, the basket elongates under the pressure. So it ended up being longer and thinner than planned! So this time I made two roundish hoops about 16” diameter. This did the trick and my mudag ended up with perfect dimensions! One thing that I couldn’t tell from the photograph was the number of ribs used. It looked like there were 5 in each of the hoop sections. However to weave continuously round and round you need an odd number to enable the weave to be opposite each time. So I added and extra rib in one of the sections. It is quite a challenge to keep an even and rounded shape! But was reasonably pleased with this my second attempt!